Guards forcibly pulled a defense lawyer out of the courtroom and the chief judge shouted down Saddam Hussein on Monday in a stormy start to a new session of the trial of the former Iraqi leader and members of his regime. After the initial squabbling, the court heard the first two defense witnesses for Barzan Ibrahim, the former chief of Saddam's Mukhabarat intelligence service. One of them was Sabawi Ibrahim al-Hassan a presidential adviser and, like Ibrahim, one of Saddam's half-brothers, who has been in U.S. custody since February 2005. The arguments and shouting began when chief judge Raouf Abdel-Rahman informed defense lawyer Bushra Khalil that she would be allowed to return to the court after being removed in a session in April for arguing with the judge. But when she tried to make a statement, he quickly cut her off, saying, "Sit down." "I just want to say one word," she said, but Abdel-Rahman yelled at the guards to take her away. In anger, Khalil shouted and pulled off her judicial robe and threw it on the floor, then tried to push away guards who were grabbing her hands, yelling, "Get away from me." As she was pulled out of the court, Saddam, sitting in the defendants' pen, objected, and Abdel-Rahman told him to be silent. "I'm Saddam hussein, president of Iraq. I am above all," Saddam shouted back. "You are a defendant now, not a president," the judge barked. The uproar was in contrast to recent sessions that have been remarkably orderly, after Abdel-Rahman took a tough line to put a stop to frequent outbursts by Saddam and his co-defendants. Abdel-Rahman first removed the Lebanese-born Khalil, the only woman on the defense team, in an April 5 session after she objected to a video of Saddam shown by prosecutors. After the outbursts, the court resumed heard defense witnesses for four hours, then adjourned until Wednesday. Saddam and seven former members of his regime face possible execution by hanging if convicted on charges of crimes against humanity in a crackdown against Shiites in the town Dujail in the 1980s. Prime Minister Tony Blair said Monday during a visit to Baghdad that establishment of a unity government means there is no longer any justification for armed insurgency and that the best way to get foreign troops to leave is for insurgents to lay down their arms. He refused however to set a timetable for the withdrawal of British troops and said their return home was governed by conditions on the ground. Car bombs and drive by shootings left 16 people dead around Iraq Monday, including seven police officers, security officials said. In Baghdad, a car bomb exploded between a clinic and a market to kill three people and injure another nine in the Shiite Amin neighborhood, killing three civilians and injuring another nine, 1st Lt. Haider Hamil said. A suicide bomber killed at least 13 people and injured 17 when he blew himself up Sunday in a downtown Baghdad restaurant frequented by police. Al-Maliki's new government met for the first time Sunday. The inauguration of Iraq's new government marks a new era in relations with the country, President Bush said Sunday. "The formation of a unity government in Iraq is a new day for the millions of Iraqis who want to live in peace," Mr. Bush said. "And the formation of the unity government in Iraq begins a new chapter in our relationship with Iraq." Japan's prime minister on Sunday refused to say when the country's troops would leave Iraq, saying the government was still discussing whether and when to pull out, despite a media reports suggesting a July withdrawal. Hundreds of men, women and children from Dujail after a shooting attack on Saddam's motorcade in the town in 1982. Dozens died in prison, from torture and poor conditions, and 148 were sentenced to death by Saddam's Revolutionary Court for alleged connections to the assassination attempt. 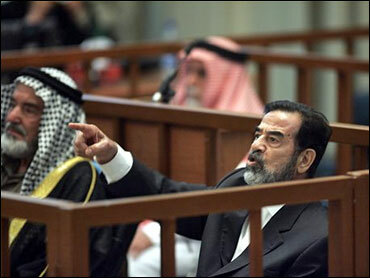 Al-Hassan took the stand in support of Ibrahim, who is accused along with Saddam of ordering the crackdown. Al-Hassan, wearing a white traditional robe and headdress, said Ibrahim told him after the shooting attack on Saddam that he went to Dujail only to make sure that the presdiential guard had not been lax in its protection of Saddam. "He told me that he only went there to check if what happend due to any neglect from the gurards and that he didn't take part in anything else," al-Hassan said. "I asked him (Ibrahim) whether they (the attackers) were from Dujail or not, and he said most of them were not," al-Hassan said. Al-Hassan, once a powerful adviser to Saddam, was on a list on a list of 55 most wanted regime figures when U.S. forces invaded Iraq in 2003 and was suspected of being a leading financer of the anti-U.S. insurgency. He was arrested in Syria, which handed him over to American forces in Iraq in February 2005. Another witness for Ibrahim, a former general director of the anti-espionage branch of the Mukhabarat, then testified from behind a curtain to protect his identity. He told the court that the Mukhabarat did not take "any special measures in the Mukhabarat building or arrested people or interrogations," trying to dispute prosecution claims that arrested families were held at the intelligence agency's headquarters in Dujail. Monday's first witness was a former staffer of the Revolutionary Court, Murshid Mohammed Jassim, testifying on behalf of defendant Awad al-Bandar, the judge who sentenced the 148 to death. Abdel-Rahman has accused al-Bandar of convicting the Shiites without a proper trial. He said the Revolutionary Court always gave defendants a full chance to defend themselves and ensured they had lawyers and that Saddam or his officials never intervened in its proceedings. Referring to the ejection of Khalil, al-Bandar asked Jassim, "Were defense lawyers ever thrown out of court when they tried to make an argument." Jassim said no, "lawyers were always treated with respect in accordance with the law." In earlier sessions, al-Bandar insisted the Dujail trial was "fair and just," saying the 148 defendants confessed. But he acknowledged that there was only one defense lawyer for all 148 and the trial only lasted 16 days. Saddam and his co-defendants have argued that the crackdown was a legal response to the assassination attempt in Dujail. But Abdel-Rahman has said the trial was "swift" with "no chance for appeal" and the prosecution has argued that it was a showtrial in which the defendants had no opportunity to present their cases. It has presented documents showing that a number of minors below the age of 18 were convicted, including one as young as 11 years old. The prosecution has also argued that the crackdown went far beyond the perpetrators of the attack on Saddam, sweeping up entire families in an attempt to punish the entire town.